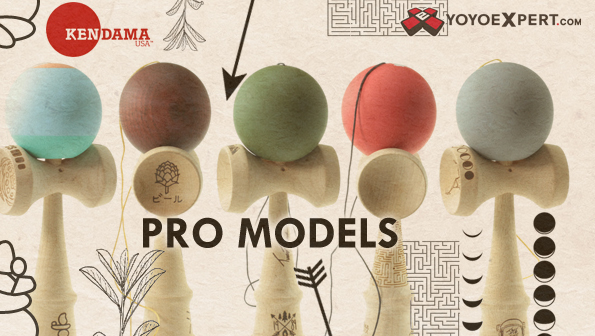 The 2014 Pro Model Kendamas have been customized to cater to each Pro's unique style and personality. Each kendama has different engravings, designed by the pros, and cool custom paint jobs. Unlike the Tributized 2013 Pro Models, The 2014 & 2016 Models use the Kaizen handle shape with traditional style assembly. - Birch spike, padauk sarado, and a sassafras tama. - Beech wood Ken W/ Sassafras Tama. - Brown tama coated with signature silk translucent paint. - Tea leaves, coffee beans & hops engraved into each of the cups. - Beech wood Ken and Tama. - Army green tama coated with signature silk paint. - Mountain peak design engraved onto rim of big cup. - Grey tama coated with signature silk paint. - Lunar Lander custom printed in big cup. - Moon phases engraved around cup rim. - Tri-color tama design for visual tracking, coated with signature silk paint. - Custom artwork burned into the handle, cups, and cup rims. - Maple wood Ken and Tama.